Some words of wisdom from this year’s Senior Quest presentations, complied by HBHS librarian Christine Heaton. 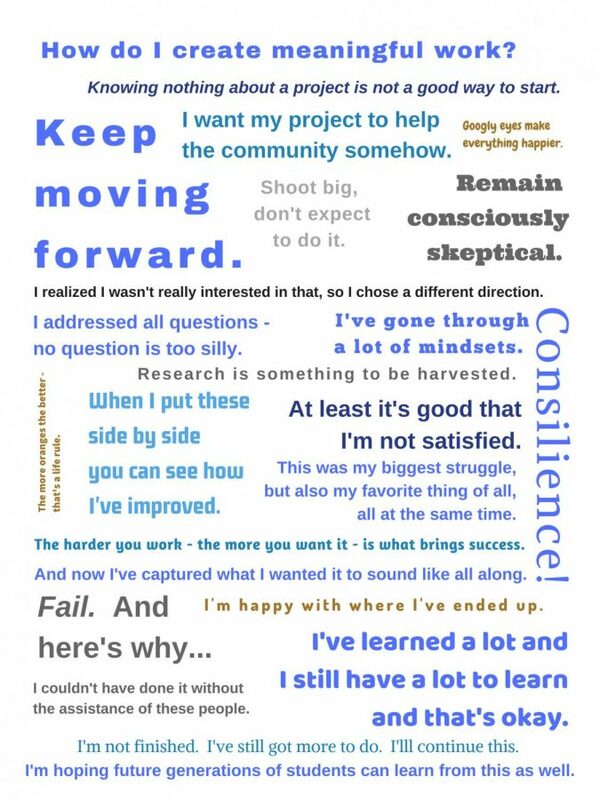 These quotes are some of the many thoughtful phrases spoken by Senior Quest students while presenting their year-long projects to fellow students, staff, and community members last Thursday. Jack Aldana-Proulx, Ryan Farquhar, Finny Rasmussen, Keely Scott, Adam McQuilkin, Paul Considine, Julia Wertz, Patrick Bloniasz, Joey Schunemann, Nick Franzini, and Liam Grant have spent their 6th period this year in a class called Senior Quest. Senior Quest is a class in which students spend their time working on senior capstone-like projects on topics that they are passionate about. The class offers an opportunity for those enrolled to do in-depth research, and in some cases, create a final product while furthering their knowledge in a subject of their choice. While the projects are mostly independent and require significant out of school commitment, the students are able to get advice from their chosen staff or community mentors, as well as HBHS librarian Christine Heaton and their teacher, Christina Ellis. This is the second year the class has been taught here at Hollis Brookline, and while the benefits of being a “quester” are clear, there are also some issues that still need to be worked out. Mainly, most of the projects involve monetary cost, whether it be for materials or to compensate for lack of resources in the school building. For example, Grant ran into issues developing film for his photography zine when he found that the art department’s dark room had been removed over the summer. Farquhar and Rasmussen, whose project involved woodworking and building, had to purchase a membership to the Makerspace workshop in Amherst because HB lacks a wood or metal shop. 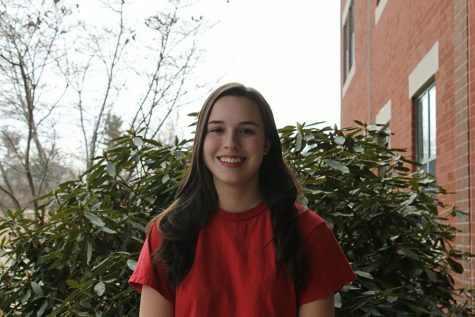 While a few students were able to get grants or donations from the community, namely Aldana-Proulx and Bloniasz, in some cases the costs were simply not affordable for the high schoolers. In fact, the HBHS library ended up contributing significantly to assist with funds for this year’s projects. This generosity was greatly appreciated by its recipients, but Heaton cannot fund these projects out of the library’s budget. “It would be nice if Quest got a small annual budget in the same way a department does, to be used specifically for academic materials needed by ‘questers’. If we had an account, ‘questers’ could use that money and then pay it back if they could afford to or if they received donations for their project. You can’t expect kids to do these amazing projects when there’s sometimes not enough money to go as far as needs to be gone. And you don’t know how much money you’re going to need until you get there,” said Heaton. In addition, software blocks on school computers made it difficult for some of the students to make the most of their work time in class. Schunemann and Franzini, both of whom had music based projects, were unable to download MuseScore, a free score-writing program. Similarly, McQuilkin could not download open-source development software on a school computer to work on his USB protocol project. Despite such setbacks, the ‘questers’ worked hard to persevere and ended the year with some truly fascinating presentations. Multiple teachers in the building made an effort to spread the word about the presentations and allow their students to go to the auditorium and listen to their peers on Thursday. But many others in the building were unaware of the amazing work done by the seniors, or even of the existence of the class. However, Ellis and Heaton are working on the logistics of presentation day so that next year, more students and members of the community will be able to attend. Completing such ambitious work takes significant time. Many of this year’s students began working on the foundations of their project multiple years before they joined the class, and none of them are completely done. Even though they are finishing high school, they plan to keep exploring their topics. One of the group’s biggest takeaways from their experience is that there is always more to do, and they will never be done learning.